During my trip to Phoenix, my sister Denise had suggested that I check out Old Town Scottsdale and when I researched it I found the Scottsdale Museum of Contemporary Art was there and both exhibits looked good to me. So I figured how to contact Lyft via my laptop and went to the museum. 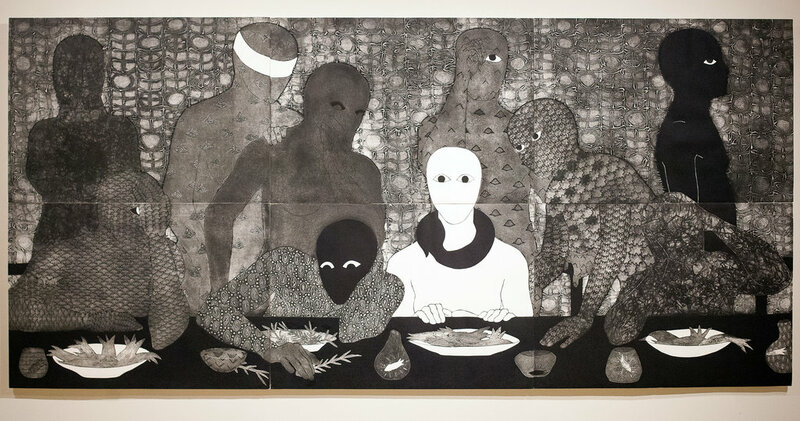 The first exhibit was NKame: A Retrospective of Cuban Printmaker Belkis Ayón (1967-1999). Ayón was in many group shows and solo shows around the world before she shot herself in 1999. She was scheduled to be in three shows in 1999 and her works made it there even if she did not. While you walk around the gallery, you can hear her speaking in Spanish, which is from a video playing in the next room. A lot of her prints are very big but she would use regular sheets of paper and join them together rather than making one big print. Some thought this was because of shortages in Cuba but she did it that way so she would have more control. The style of printmaking she used is collography, where a collage is made from different materials, ink added, and then put through a printing press. 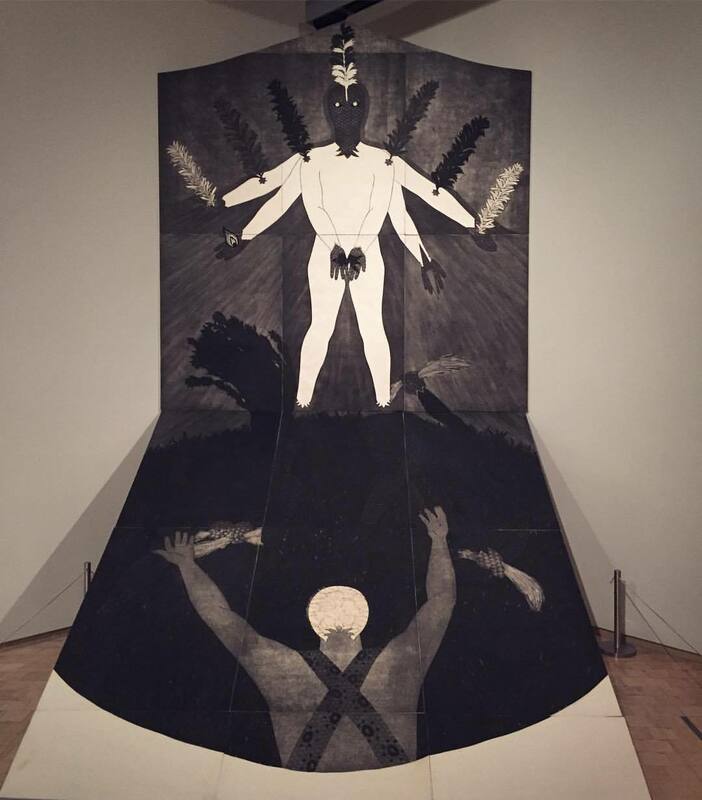 There was a video showing Ayón creating one of the pieces in the gallery. After watching the process, I ran over to the piece to see the result again. Her work mostly centers on the religion Abakuá, which is a secret society (NKame means “greetings” or “praise”) restricted to men. 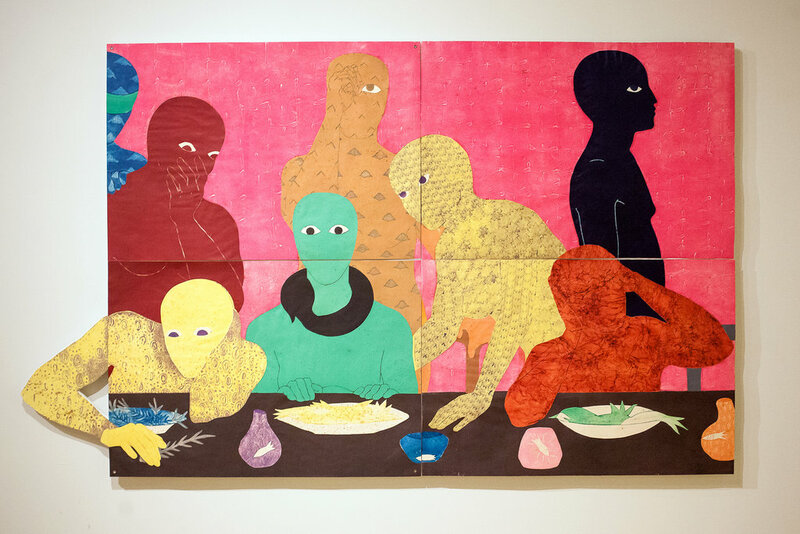 Ayón added a feminist edge to the stories she told via her prints. It is one of several Afro-Cuban religions (this one from southeastern Nigeria) and Ayón made the decision to focus on Abakuá because so many artists have already focused on Yoruba and Congo. There is a story that she told in another video and a similar story told in one of the exhibit labels. As Ayón tells it, the Princess Sikán (the only female in Abakuá stories) goes to the river to fetch water. She places the gourd in the river and waits for it to fill up. Unbeknownst to her, the magic fish flows into the gourd. The fish has the voice of an ancestor and gives power to whoever hears it. While carrying the gourd on her head, she hears the sound and does not know what it is. It frightens her and she drops the gourd. In the meantime, the witch doctor has a mirror that keeps track of the magical fish in the river and sees that it is gone. He sends two assassins to kill whoever has captured the fish. They find Sikán and use snakes to kill her. The witch doctor thinks that maybe the voice of the fish (dead because it was out of the water) has traveled to Sikán and they skin her in hopes of capturing the voice. But like the voice of the fish, Sikán’s voice is muffled. They use animal skins for their drums instead. In the museum label, the witch doctor has told Sikán’s parents about the magical fish and has sworn them to secrecy. The fish brings peace to whichever tribe has control of it. Sikán tells her lover, who is the prince of a neighboring tribe with which her tribe is at war with, and the enemy takes the fish. Sikán is killed for revealing the secret. To recreate the sound of the fish, they use goatskins for their drums. I found the work to be very spiritual. Most of her pieces are in black, white, and gray but there are some earlier pieces in color. 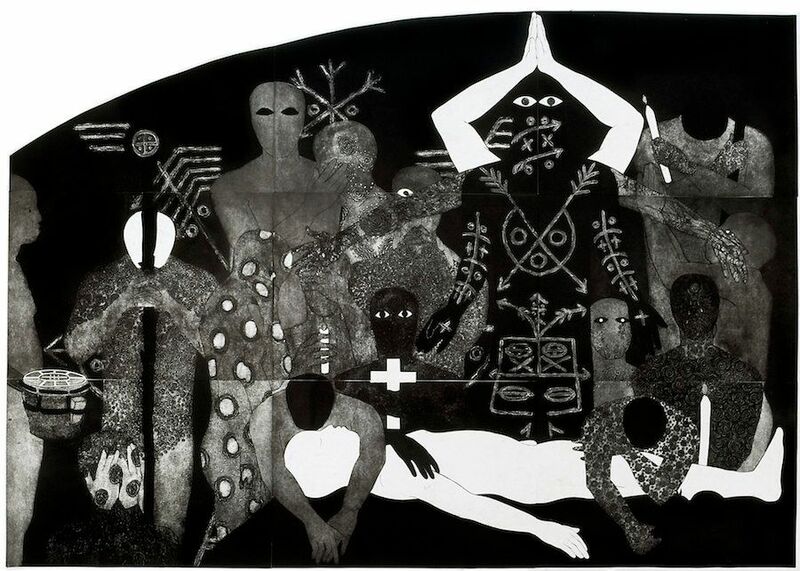 Here is “La cena,” (“The Dinner”) which depicts an Abakuá ritual (initiation banquet called Iriampó) but also makes you think of “The Last Supper.” Like all Afro-Cuban religions, the African rites are mixed in with Christian rites. The original was in color and then she made one with some color, which is a mirror image of the final version in black and white. All three were on display. 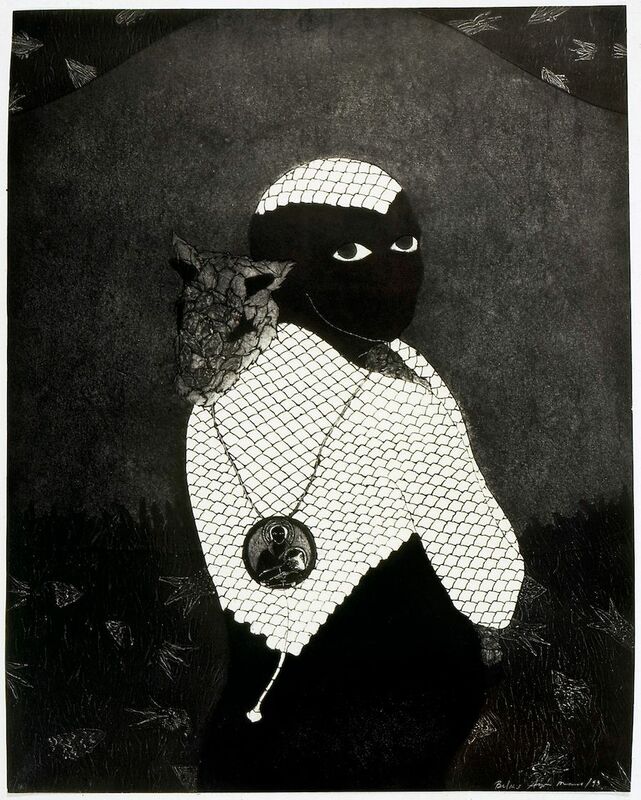 “Sin título (Sikán con chivo)” (“Untitled (Sikán with Goat)”) Although goats would be common in the religious imagery for this religion, Ayón rarely used it. “Nlloro” (“Weeping”) depicts another Abakuá ritual but contains a cross and looks like people weeping over Christ’s body. Ayón was an atheist. “Pa’ que quieras por siempre” (“To Make You Love Me Forever”) was being shown at the Venice Biennale in 1993. Ayón and her father had to travel by bicycle 30 km to get to the airport. Her father did not make the plane on time but the piece got to Venice one hour before the opening. “The Consecration” was a huge triptych in the middle of the gallery. “Perfidia” (“Perfidy”) is considered one of her greatest works. I could have spent hours in there just staring at these prints. Experiencing them was spiritual for me. Emotions leaped off the prints and into my heart and soul. The other exhibit was a double one – Double Agents: Carla Fernández and Pedro Reyes. Both envision an alternative future. Fernández does ethical fashion. She buys textiles from communities throughout Mexico to keep the traditions alive and to give the woman a living, so they do not have to move to the cities to work. If you go to her site, you see the photos along with the sayings just like below. Reyes’ “Disarmed (Mechanized)” built eight instruments using the remnants of weapons collected and destroyed by the Mexican army. My favorite was the xylophone. The hammers came down on different sized rifle barrels. All the instruments played intermittently by themselves, so you never knew when you were going to hear sounds coming out of them as you walked around. A companion video project is “Amendment to Amendment” that invited people to rewrite the Second Amendment to the US Constitution. Also in the room was a huge poster that named all the indigenous people of North, Central, South America, and the Caribbean – all in the shape of the continents and islands. They had smaller poster to take for free and I am going to frame mine. The building itself looks new and they have a small courtyard with chairs that are like art pieces and James Turrell’s “Skyspace,” where you can sit and see the sky above and you see the sunset on Thursdays, Fridays, and Saturdays. This is a wonderful little museum.